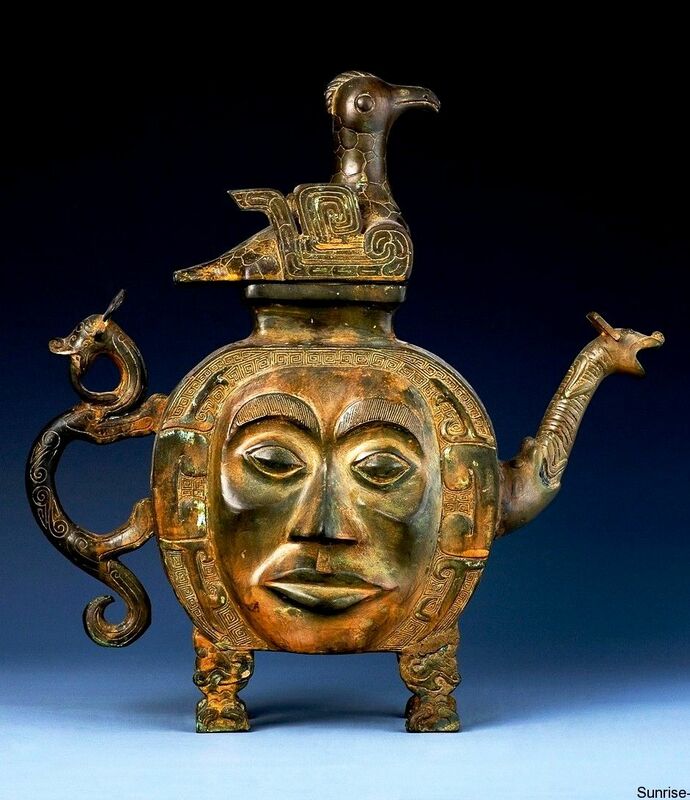 The Shang religion was characterized by a combination of animism, the idea that everything has a soul; shamanism, the belief in shamans who have the ability to communicate with the spiritual world; ancestor worship; and divination. Different gods represented natural and mythological symbols, such as the moon, the sun, the wind, the rain, the dragon, and the phoenix. The shaman operates primarily within the spiritual world, which in turn affects the human world. The Shang believed in the afterlife, and that family was important. These are two facts that can be supported by the Shang religion, which is focused on ancestor worship. The tombs of Shang rulers are also evidence of their belief in life after death. Along with the dead, these tombs contain artifacts of furniture, sculptures, weapons, and money–all things they might need in the afterlife. Some tombs of the ruling elite even contain the skeletons of soldiers, slaves, servants, and animals that were sacrificed to serve their master in the next life. The Shang believed their dead ancestors held powers in the afterlife that could either help them succeed or cause them to fail. So, to keep in their good graces, people honored their ancestors by offering up food, wine, and other gifts. Sometimes, those gifts were in the form of human sacrifices. It was through his ancestors that a Shang king held the authority to rule. This meant a king had a very big reason to keep his ancestors happy by following their wishes. To ensure that he was doing as the ancestors would want, the king used oracle bones to communicate with them. Oracle bones could be used for matters as simple as advice on the day’s weather to whether or not a king should send his military into battle. To get the ancestor’s answer, the priest would write the king’s question on an oracle bone, which was a turtle shell or animal bone. Next, the priest would heat the bone over a fire or press a hot needle against the bone, causing it to crack. These cracks were then translated as the ancestor’s response. Sometimes the message was carved into the bone afterward. Then, after the event actually occurred, the final result was also recorded. This showed whether or not the prophecy came true or how the situation turned out. It is from these carvings that historians have learned a great deal about the life of the Shang. While the Supreme Ancestor was not accessible to the mediums (wu巫, “shamans” or “sorceres”) or the Shang king, the latter’s more direct (historical) ancestors were. The ancestors communicated with the king not just by the cracks in oracle bones (bu 卜), but also in dreams and maladies. By the end of the Shang dynasty, the king was the only one who could interpret the oracle bones, thereby making him the head shaman. The Shang kings, who considered themselves divine rulers, consulted the great god Shangdi—the Supreme Being who ruled over humanity and nature—for advice and wisdom. The Shang believed that the ancestors could also confer good fortune; the Shang would consult ancestors through oracle bones in order to seek approval for any major decision, and to learn about future success in harvesting, hunting, or battle. It appears that there was belief in the afterlife during the Shang dynasty. Archaeologists have found Shang tombs surrounded by the skulls and bodies of human sacrifices. Some of these contain jade, which was thought to protect against decay and grant immortality. Archaeologists believe that Shang tombs were very similar to those found in the Egyptian pyramids in that they buried servants with them. Chinese archaeologists theorize that the Shang, like the ancient Egyptians, believed their servants would continue to serve them in the afterlife. Because of this belief, aristocrats’ servants would be killed and buried with them when they died. Another interpretation is that these were enemy warriors captured in battle. One elaborate tomb which has been unearthed was that of Lady Hao, a consort of a Shang king who reigned around 1200 BCE. The artifacts found in her tomb indicate that she had a high social status and a great deal of power in Shang society, which makes historians speculate about the role of women in the Shang dynasty. 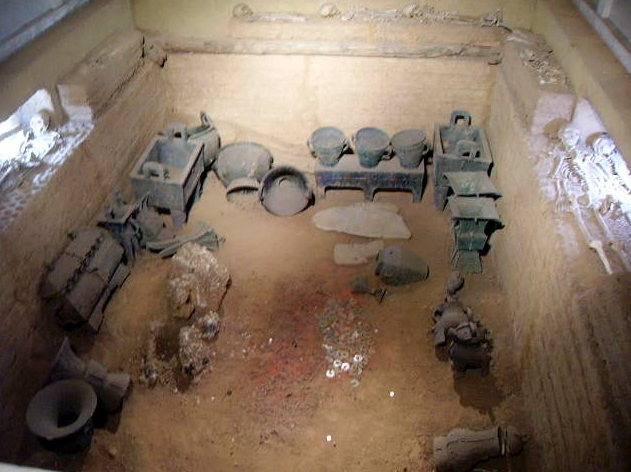 Based on the artifacts found in Lady Hao’s tomb, it seems that she had her own wealth and political influence, and it is possible that she also had a prominent role in the military, as many bronze weapons were found buried with her.